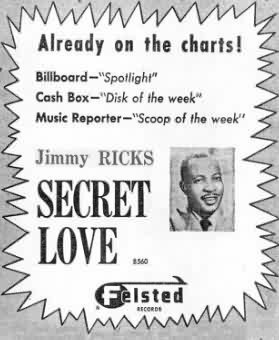 After he left the Ravens in 1955, Jimmy Ricks did mostly solo work for the rest of his career. He made many recordings, but without much success, through the end of the 60s. The only place where we get into real trouble is with the recordings that Ricks did for Festival in the 60s. 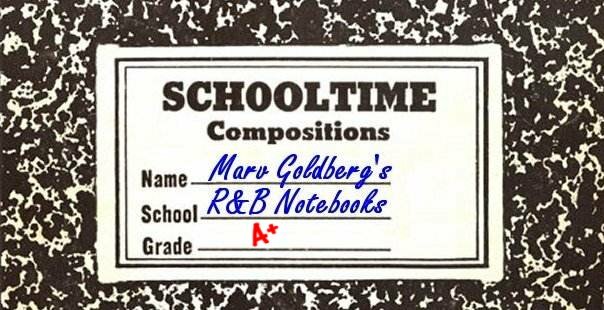 These were actually independently produced by Herb Abramson (the Ravens' old publicist from National, who had subsequently been president of Atlantic Records and then head of Atco, from its inception, until 1958). Backing Ricks are a variety of singers, many of whom had been in the Ravens. On November 10, 1961, Ricks recorded three masters: "Daddy Rollin' Stone" (the Otis Blackwell classic), "Deep River," and "Umgowa Twist." On these, Ricks is backed up by Leonard Puzey, as well as Howard Guyton and Derek Martin, both original members of the Pearls. In December 1961, "Daddy Rollin' Stone" and "Umgowa Twist" came out on Abramson's Festival label (credited to Jimmy Ricks & the Raves). "Daddy Rollin' Stone" showed that Ricks still had it, but "Umgowa Twist" is an embarrassment reminiscent of "Rooster." Presumably Atco thought so too. Before they reissued "Daddy Rollin' Stone" in February 1962, they decided it needed a new flip. 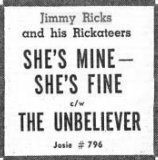 Thus, on January 23, 1962, Ricks, along with Joe Van Loan, Paul Van Loan, and Jimmie Steward, recorded "Cecilia," "You've Got Just What I Need," and "Homesick." "Homesick" was the track chosen for the Atco release. 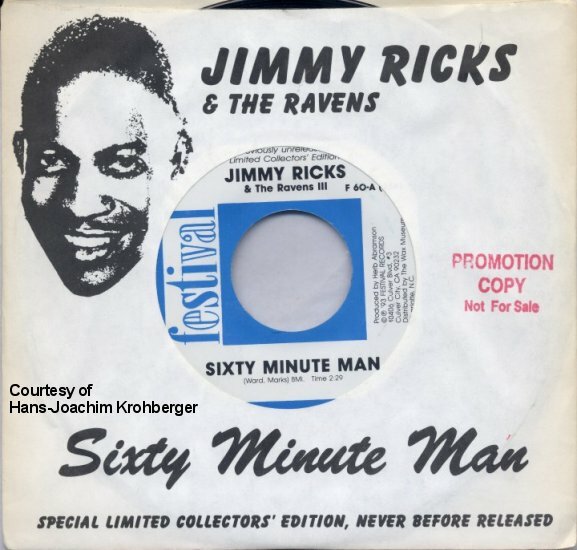 On July 14, 1973, Ricks, backed by unidentified singers, recorded "Sixty Minute Man," "Tears Don't Care Who Cries Them," and "Fine Brown Frame" for Abramson. 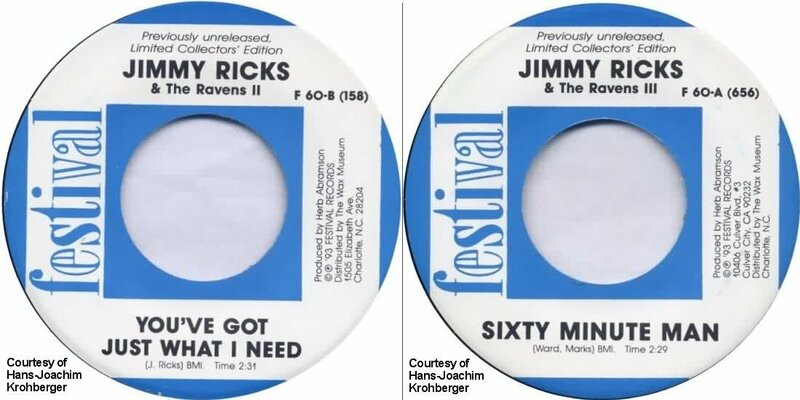 "You've Got Just What I Need" (from 1962) was paired with "Sixty Minute Man" for a 1993 Festival release. The record sleeve claims that it's by the "Ravens," but the label credits "You've Got Just What I Need" to the "Ravens II" and "Sixty Minute Man" to the "Ravens III." 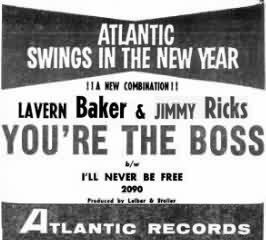 In the early 70s, Ricks worked as the vocalist for the Count Basie orchestra. There are a few existing recordings, that were supposed to be released on Norman Grantz' Pablo label in December 1998, but apparently the CD never materialized. The listed Ricks titles for Blues At The Philharmonic: The Basie Blues Singers were: "I'm Gonna Sit Right Down (And Write Myself A Letter)," "It's Only A Paper Moon," "Willow Weep For Me," and "C.C. Rider" (the CD was also to contain tracks by Joe Turner and Eddie "Cleanhead" Vinson). 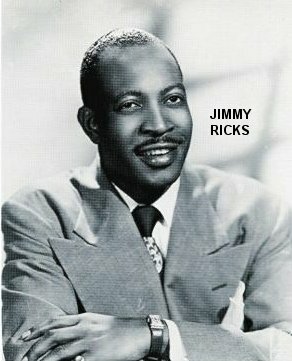 Jimmy Ricks, the inspiration to an entire generation of bass singers, died on July 2, 1974.